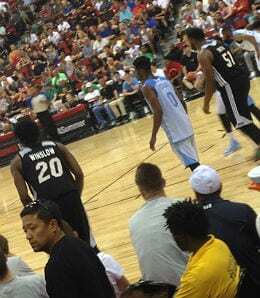 Emmanuel Mudiay (0) could be the starting PG for Denver this season. Before you know it, another NBA season will be upon us and we’ll be playing daily fantasy basketball at sites like DailySportsGeek. 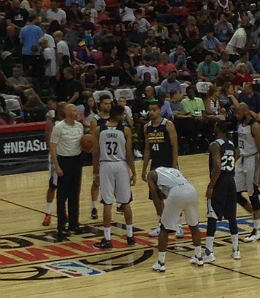 To whet your appetite for some hoops, let’s look back on the 2015 Summer League. McCade Pearson attended some games recently and filed the following photos. Scouting reports by RotoRob. 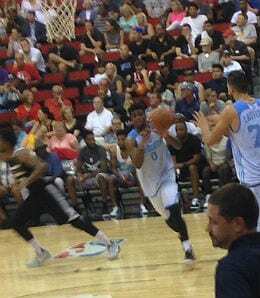 Denver guard Emmanuel Mudiay (above) is a 6’5″ point guard from Congo who was taken seventh overall in this year’s draft. Just 19, he played professionally in China last season before an ankle injury cut short his campaign after just nine games. Mudiay played serious minutes in Summer League, but his shooting touch (38.5 per cent) left something wanting. He struggled from beyond the arc and at the line, too. The Nuggets have intimated that Mudiay will start over Jameer Nelson, and while Mudiay is going to get the minutes, his percentages and turnovers will make him a shaky Fantasy play. Karl-Anthony Towns (32) could turn the T-Wolves around. Minnesota plucked Karl-Anthony Towns with the No. 1 overall pick in the draft in the hopes that he could develop into the next Anthony Davis. Towns has never really gotten the hype that most No. 1 picks get because he was either overshadowed or part of a system in high school and college (Kentucky). At seven-feet, 250 pounds, he’s definitely big enough to be an NBA centre, although we expect him to struggle in the post early on. Still, at 19, Towns was likely the only player in this year’s draft that has a chance to develop into a franchise player. In five Summer League games, he flashed his rebounding talent and even showed a nice passing touch. We can envision plenty of 20-10 games in Towns’ future. Justise Winslow (20) could be one of the steals of the draft. Justice Winslow was the 10th overall pick in 2015, selected by Miami. A small forward at Duke, he could see time at the two in the NBA. Just 19, Winslow is 6’7″, and if he can stick at small forward, he’ll fill a big hole on the Heat and could prove to be a serious bargain at this stage of the draft. He didn’t play heavy minutes among his six Summer League games, but he shot very well from the line and looked like he had the defensive acumen to play in the NBA. If Winslow grows another inch and fills out to around 245 pounds, he’s going to be handful at SF. Trey Lyles is yet another Kentucky product that went high in the draft. Trey Lyles was taken 12th overall by Utah. The Canadian-born, U.S.-raised power forward stands 6’10” and weighs 241 pounds. Yet another product of John Calipari’s Kentucky system, the 19-year-old Lyles made the All-SEC Freshman Team last season. Lyles has shown the ability to adapt to different systems and the fact that he played SF on such a massive Wildcat team speaks to his versatility. But with a 7’4″ wingspan, he’s clearly a big man. We’re not sure how many dimes and blocks Lyles will get, but the points and boards will be there. 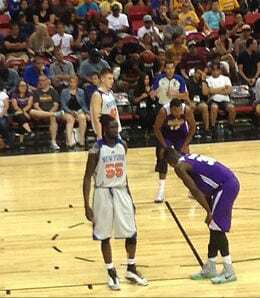 Maurice Ndour (55) sure took advantage of the Summer League stage. Maurice Ndour went undrafted and, after playing for the Knicks in the Summer League, the Senegalese forward signed with the Dallas Mavericks in July. The Mavs gave him a guaranteed deal based on his play at the Summer League — he was one of the biggest stories this summer based on his balls-out hustle. The Knicks had their chance, but a guaranteed deal swayed his mind. The 23-year-old, 6’9″ Ndour showed an ability to score, a good FT shooting touch, solid rebound skills and shot swatting capability. His signing is part of a trend by Dallas to add athleticism to its roster. Ndour, who played at the University of Ohio, got more than three times as much from Dallas as the Knicks had offered. New York may regret not opening its coffers a bit wider for this kid. Now it’s your turn. Let us know in the comments below who caught your eye in the Summer League.